Pectin is structural heteropolysaccharide contained in the primary cell walls of terrestrial plants. It is produced commercially as a white to light brown powder, mainly extracted from citrus fruits, and is used in food as a gelling agent particularly in jams and jellies. It is also used in fillings, medicines, sweets, as a stabillizer in fruit juices and milk drinks, and as a source of dietary fiber. Pectin is an ingredient and a natural component of plants that is especially abundant in apples and citrus fruits. Fruit pectin is associated with cellulose in plant tissues, where it plays a fundamental role in determining their mechanical properties. Pectin, as a food ingredient, can be used as a gelling agent, thickening agent and stabilizer in food applications. 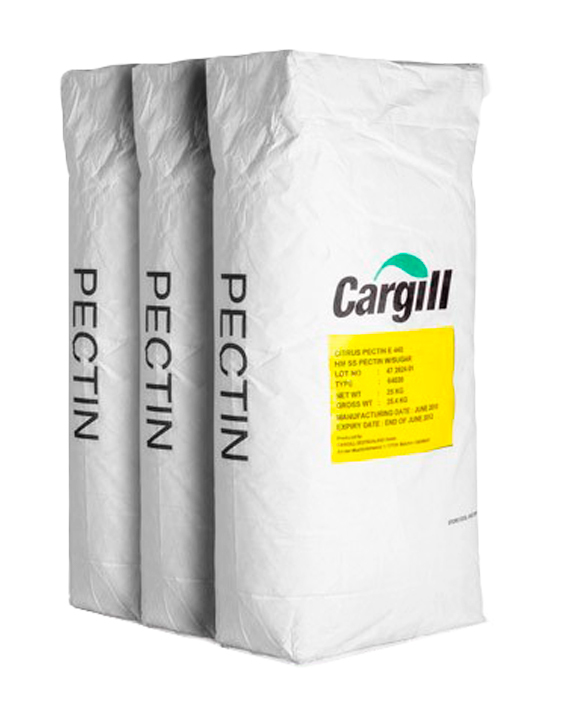 Cargill is a pectin supplier to the food industry. This type of pectin requires high amount of sugar to gel properly and sensitive to acidity. This type of pectin does not require high amount of sugar and less sensitive to acidity, but requires calcium to gel.